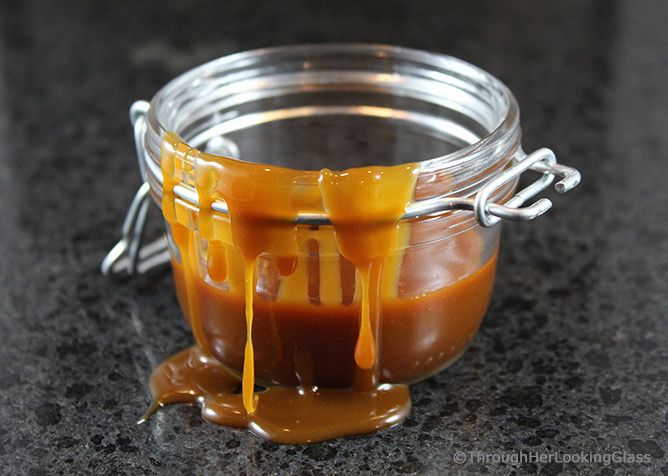 Homemade Salted Caramel Sauce is so easy to make and turns everything it touches golden. Literally. Think ice cream, cakes, pies, cookies, bars, pretzels, cupcakes, cafe drinks – you name it. Just a drizzle of this velvety smooth and rich salted caramel sauce elevates any dessert to instant stardom. You’ll need only four ingredients and about ten minutes. So when we woke up this morning, the white was gently falling from the gray sky. We knew the storm was coming, it just arrived a little earlier than predicted. School was canceled for everyone today but my little Hudson. I thought about just keeping him home, but the roads still looked good and since we have four wheel drive on one of the cars, we sent him in and picked him up at lunchtime. Snowy mornings are always an extra challenge around here, especially with Hudson. Hudson is six and has Down syndrome. He has no interest in wearing hats, scarves or mittens, and pulls them off (and chucks them!) as quickly as you can wrestle them on. To make matters worse, the bus arrived eight minutes early this morning and I was already running behind. EIGHT WHOLE MINUTES! I don’t know about you, but I can accomplish a heck of a lot in eight minutes when pressed. So when the bus arrived early and the horn tooted, I still had Hudson’s lunch to finish, sippy cups to fill, his speech device and charging cord to pack, pull-ups to find, along with the snow boots in his room upstairs and another winter coat in the basement closet. (His little red one got left at church on Sunday.) I pulled my down jacket on over my flannel pajamas and raced out to the bus to ask about the road conditions and if they had time to wait. Once the the little yellow bus left with my small charge on board, I collapsed on the living sofa for a minute, then quietly asked Charlie (10), a very important question. “If I were to make Salted Caramel Sauce for the blog today, would you be willing to hold the spoon so I can get drizzly caramel pictures?” Charlie slowly looked up from his book and surveyed the situation. “Mom, I really think you should just re-publish something today,” he said gravely. “You don’t look well. Your eyes are all dark. Maybe you should just rest.” He spoke truth. This recipe is adapted from New York Times Chef Bobby Flay’s salted caramel sauce recipe. 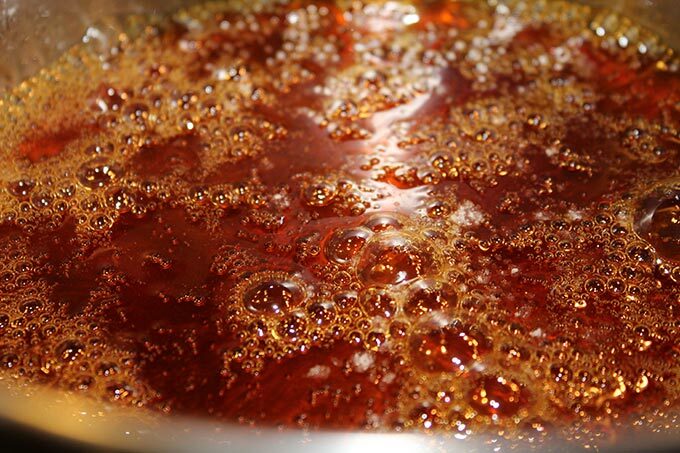 Pay close attention to the boiling sugar and water mixture at about the seven minute mark – you are watching for a deep amber color. 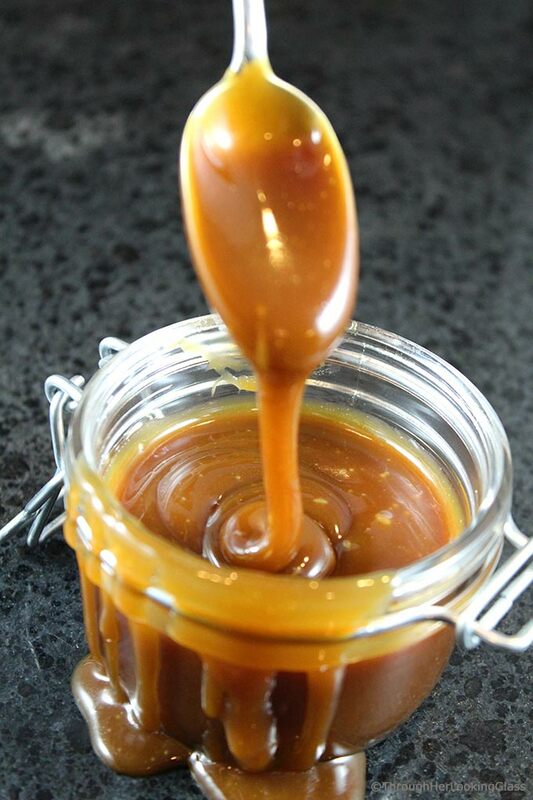 This caramel sauce thickens beautifully as it cools, so if you want that thick sauce, wait until it’s nearly cooled to pour over desserts, ice cream etc. 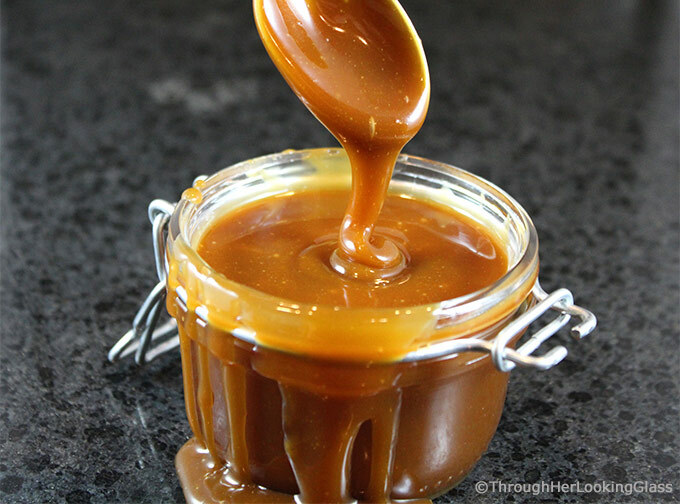 Store salted caramel sauce in an airtight container in the refrigerator and heat on low on the stovetop (or in the microwave) to thin for pouring. 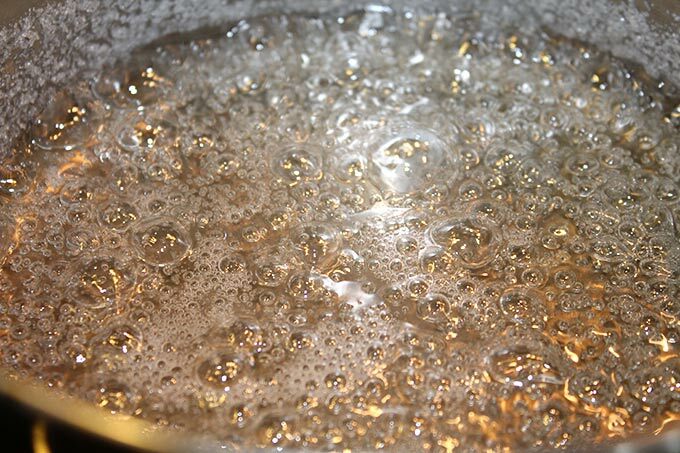 In a medium-sized sauce pan stir together 1/4 cup cold water and granulated sugar until combined. Set over medium-high heat on the stove top and cook 9 -11 minutes without stirring, or until mixture is a deep amber color. Start checking closely at the 7 minute mark. 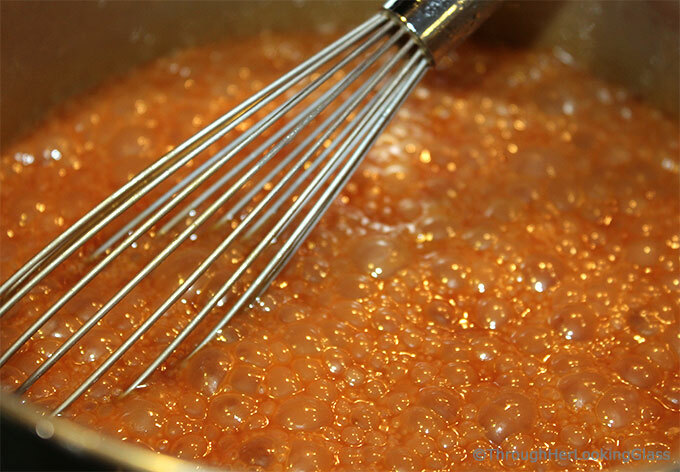 Whisk over the heat until it's smooth a minute or two, then remove from the heat. Salted caramel sauce will thicken up as it cools. When sauce is still warm, spoon over ice cream, cake, pie, cupcakes or cookies. Store extra sauce in an airtight container in the refrigerator, just reheat on low to thin. Is there a way to can this or does it have to stay refrigerated? It looks like it would make an awesome gift. Hi Debi - I'm so glad you asked this - I was seriously thinking the same thing but hadn't done the research yet. I googled about the safety of canning caramel sauce and this is the response I got, which is a resounding and disappointing no, because it has dairy in it. Here is the link with some really good information: https://food52.com/hotline/22527-canning-caramel-sauce -- I am disappointed too, because it would look great in my Christmas gift baskets, but I absolutely would not want to risk making anyone sick. Thanks for this great question and I wish I had a better answer. I give homemade peppermint bark (that has to be refrigerated) in gift baskets at Christmas and I just add a label that says please refrigerate. I know that does not work for gifts that you need to send, but maybe it is an idea if you make some caramel sauce for friends/family locally. Thanks so much for dropping by! Who knew it was easy enough to make?! This looks and sounds absolutely divine! Carmel and salt...could there be a more wicked combination? Sweet and salt, I love it! There went the diet! 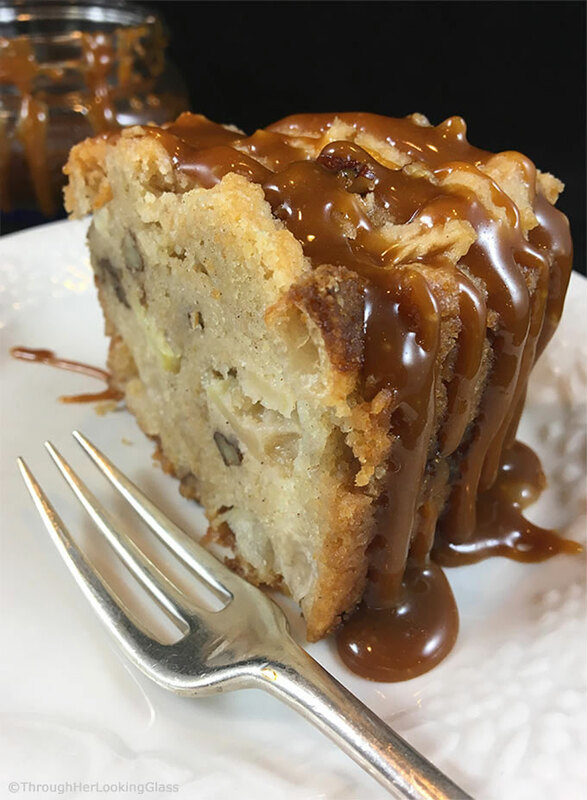 I'd love this drizzled over vanilla ice cream or your gorgeous apple cake! It looks amazing! Great drizzly spoon shot -- kudos to you and Charlie :) Your posts make me smile to think of someone else running around like that - very cute - and happy I'm not the only one! What a nice treat here! This would be delicious on so many things! Ice cream, brownies…or all by itself with a spoon! That nap sounds very well deserved! And what better to do after a rest than to make caramel?! Yay! This looks perfect! You make me laugh! I'll bet the bus driver has some good stories to share! We've had two snow days this week....tons of snow and then freezing rain and now everything is melting and we are in a flood warning! 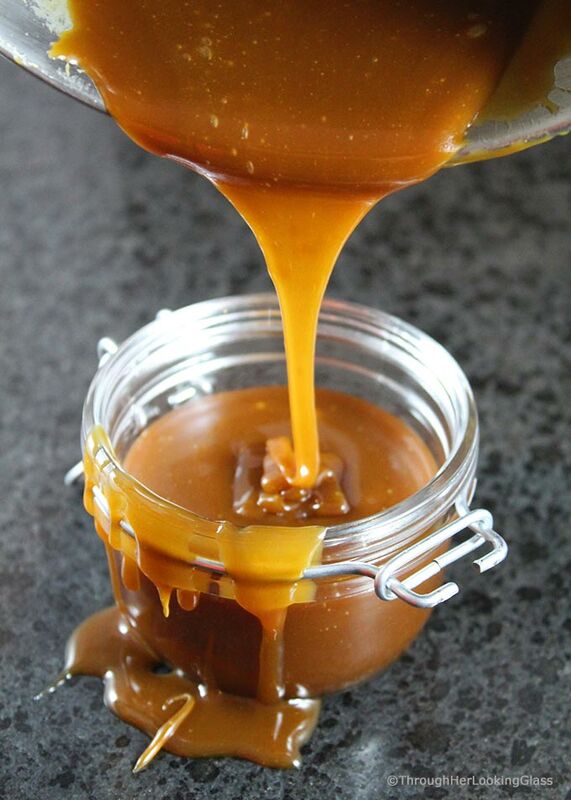 This caramel sauce looks so delicious! It would be perfect drizzled over ice cream! Haha - Oh Allie, racoon eyes or not, you are one gorgeous gal! And yup, am with ya - I can get a lot done in 8 minutes - though 8-minutes under pressure might have me forgetting half the things I could have done - so thumbs up to ya! And - speaking of thumbs up - dang - this sauce needs two thumbs up for sure - so so sweet and sticky and caramel-y! When I saw that first picture only one word came to mind - GLORIOUS! So glad Charlie held the spoon - am hoping you didn't have to do the Hudson Hustle today and y'all are all bundled up and staying warm today! XOXO P.S. So sorry I've been MIA - been trying to juggle a few classes at the local community college with work and home stuff...I hope all the painting is going well and am hoping y'all find a good buyer, quick! PEANUT BUTTER????? GAHhhhhh....now we're talkin'! Super to hear from you Jay, thanks for dropping by.